“Russia hacked the election” and other fake news — whatever happened to journalism? So with respect to WikiLeaks, I don’t see a contradiction. First of all, I haven’t commented on WikiLeaks, generally. The conclusions of the intelligence community with respect to the Russian hacking were not conclusive as to whether WikiLeaks was witting or not in being the conduit through which we heard about the DNC emails that were leaked. From the official transcript available at the White House archive. Because what does he intend when he says “witting or not” – “witting or not” of what precisely? Wikileaks has never denied being “the conduit through which we heard about the DNC emails” – so why does Obama say any of this? And, more importantly, why does he then conclude this statement saying “…the DNC emails that were leaked.” Weren’t the DNC emails allegedly hacked? Wasn’t that the whole point? When I posted the previous article, not for a moment did I anticipate this already stale (nearly six months old) and contrived accusation of Russian hacking might be reheated and making the headlines well into the new year. Nor could I have envisaged that in the interim no fewer than two ‘intelligence reports’ would be issued to serve as flimsy support for otherwise groundless claims. Two reports with extremely serious sounding titles and elaborate illustrations, but not a single shred of evidence between them. Although that last part comes as no surprise at all, of course. But before considering these twin tissues, not of lies, but of unsupported assertions, it is helpful to first remind ourselves what is to be understood when we read that “Russia hacked the election”. Because in spite of the seeming inference contained in those excitable words, the accusation falls far short of any literal suggestion that the Russians hacked into electronic voting machines or otherwise meddled directly in America’s electoral process. Back in July it was quite evident that this fantasy about dastardly Russian interference had been concocted in order to misdirect everyone from the incriminating substance of the emails as such. And up to a point the distraction worked wonderfully well, even if the leak still did result in the embarrassing and untimely resignation of DNC chairperson Debbie Wasserman Schultz. Indeed, as the election neared, this evidence-free story was quietly sidelined, since Clinton’s victory had then appeared a nailed-on certainty. But now, in the wake of Clinton’s shock defeat, the same unfounded insinuations that provided such a convenient decoy, with Putin standing in as a readymade scapegoat, have been rehashed again. Promoted by a neo-con establishment suddenly desperate to play the Russia card once more, we witness a choreographed outcry from the likes of Brennan and McCain, and the frenzied release of these half-baked ‘intelligence reports’. This report is provided “as is” for informational purposes only. The Department of Homeland Security (DHS) does not provide any warranties of any kind regarding any information contained within. The FBI/DHS Joint Analysis Report (JAR) “Grizzly Steppe” was released yesterday as part of the White House’s response to alleged Russian government interference in the 2016 election process. 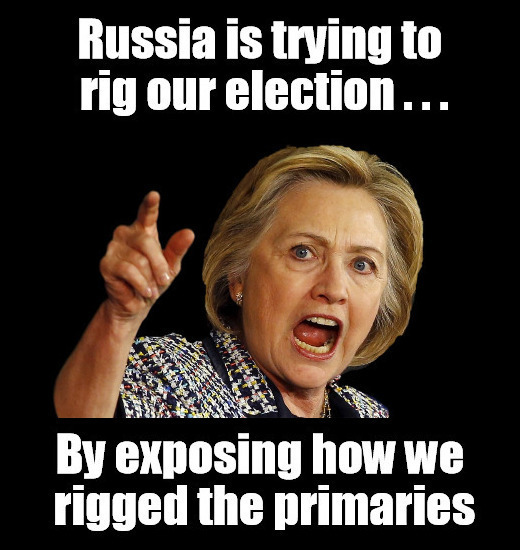 It adds nothing to the call for evidence that the Russian government was responsible for hacking the DNC, the DCCC, the email accounts of Democratic party officials, or for delivering the content of those hacks to Wikileaks. If the White House had unclassified evidence that tied officials in the Russian government to the DNC attack, they would have presented it by now. The fact that they didn’t means either that the evidence doesn’t exist or that it is classified. If it’s classified, an independent commission should review it because this entire assignment of blame against the Russian government is looking more and more like a domestic political operation run by the White House that relied heavily on questionable intelligence generated by a for-profit cybersecurity firm [i.e., CrowdStrike] with a vested interest in selling “attribution-as-a-service”. Click here to read Carr’s full analysis. Grizzly Steppe appeared to most experts as more of a Grizzly Misstep but never mind because we didn’t have to wait long for the next instalment: the considerably longer, still glossier and top-heavily titled “Office of the Director of National Intelligence Statement on Declassified Intelligence Community Assessment of Russian Activities and Intentions in Recent U.S. Elections” which was released on January 6th. This final (presumably…?) ‘assessment’ is a good deal fatter but no less flimsy when it comes to verifiable substance than the preceding ‘report’. In fact quite sensationally, it presents nothing of any relevance or further significance whatsoever – but then what did we honestly expect? After weeks of bombshell headlines based on statements from anonymous intelligence officials, western media finally had an official intelligence report to support their bombshell headlines. Unsurprisingly, all headlines look very similar, with the Guardian even changing the title of their main story after realising it was not menacing enough. The problem is that, much like the old stories, the new ones do not contain any evidence to support the claims, because the report itself does not have anything in that regard. Click here to read Ricardo Vaz’s in-depth critique. The propaganda surrounding the “Russia hacked the election” meme is, quite frankly, beneath the intelligence of The Corbett Report community. But this hodgepodge of evidence-free assertions is still driving the 24/7 fake news cycle, so today James rolls up his sleeve and shows the latest propaganda for what it is. The silliness justly deserves to be ridiculed but still when the world’s most powerful nation is butting heads with its nuclear-armed rival we had better take stock. As we enter into exceptionally turbulent times, the mind-numbing absurdity of current affairs ought not to obscure this. So surely the most troubling aspect in the ongoing farce is the leading part played by our lamentable media, whose remaining purpose has now been reduced to the repackaging and peddling of an authorised narrative – no matter how nonsensical or deficient in factual basis. As Glenn Greenwald recently said in an interview (January 5th) on Democracy Now! “the same people pretending to be crusaders against fake news… are themselves disseminating it more aggressively than anyone else”. The first was on November 24th, when they claimed, based on a newly formed anonymous group, that there has been a very widespread, successful effort to implant Kremlin propaganda in the American discourse. And they accomplish this by giving credence to this secret list that this anonymous group of cowards had created in which they claim that a whole range of American media outlets and websites, such as the Drudge Report and other libertarian critics of Hillary Clinton on the right and long-standing left-wing critics of the Democratic Party, like Naked Capitalism and Truthout and Truthdig on the left—they decree them to be tools of Kremlin propaganda. And The Washington Post created this huge story, that went all over the place, based upon giving credence to this list and saying that Russian propaganda had been viewed more than 200 million times in the United States. Journalists all over Twitter, throughout the American media, mindlessly spread it, aggressively endorsed it. It became a huge story. And over the course of the next two weeks, the story completely collapsed, and there’s now a major editor’s note at the top of the article disclaiming the key source, saying that they did not intend to in any way vouch for the validity of the findings of the source on which the entire story was based. And in both cases, the retractions were barely noted. So you have millions of people being misled into this hysteria, into this view that Russia is this grave threat, and when the story journalistically collapses, they barely hear about it. Click here to watch the full interview or read the full transcript on the Democracy Now! website. The longevity of all this ‘fake news’ about Russian hacking helps lay to rest the opinion that the fourth estate is merely in a state of crisis. Bereft of any vital signs, we must regretfully acknowledge that it has finally expired altogether; suffocated beneath the weight of its own self-importance. The demise of mainstream journalism is seemingly complete. Maitlis [from 1:20 min]: But hang on a sec, [this latest allegation] was taken seriously by the CIA – by the Central Intelligence Agency. Doesn’t that elevate it above gossip? Greenwald: Right, so the CIA is an agency that has repeatedly got caught lying in the past. It is designed to disseminate propaganda. And they’re currently in open warfare with the person who was just elected President of the United States. They were behind Hillary Clinton’s campaign. So I agree that once the CIA briefs the President and President-elect on this document it becomes newsworthy to report that fact, but the mere fact that the CIA tried to enshrine this document in a cloud of authenticity or credibility doesn’t for me as a journalist convince me at all that the claims are true. I want to see evidence first that the claims are true. Maitlis: Hang on a second – you’re calling the CIA partisan. Are you basically suggesting that if Donald Trump then goes on to ignore everything that the CIA tells him that’s no great loss to America? Maitlis [interrupting]: You said that the CIA was partisan – that it was pitted against the President-elect. Greenwald: Well, that’s absolutely true. The former head of the CIA, Michael Morell, went to the New York Times and endorsed Hillary Clinton. George Bush’s CIA head, General [Michael] Hayden went to the Washington Post and did the same thing. They both accused Trump of being a recruit of Vladimir Putin. Maitlis: So in that case whatever they tell him he would have to take with a pinch of salt because he would see them as a partisan organisation. Is that what you’re essentially suggesting? Greenwald: I would say that any rational human being with even minimal history of the United States and the CIA would take everything that the CIA says with a huge grain of salt. I would call it actually a dose of rational scepticism. Given how many times in the past that agency has lied and been in error. You know of course don’t you that the Iraq War was started because that agency said Saddam Hussein had weapons of mass destruction and was in alliance with al-Qaeda. Something that turned out to be tragically untrue. So of course people would treat those claims sceptically.